Your fortune always comes true. Do any of you collect your fortunes from Fortune Cookies, like I do? When I get a fortune that I like, I take it home and put it somewhere like on a windowsill or on my dresser, in a drawer or box, or in my bowl of paperclips. I keep finding fortunes that I’ve stashed around the house in random places. And you know what? These fortunes always come true – and many are already true. Not surprising, you say, because those people who are writing up sayings on Fortune Cookies are only writing things that are likely or possible to come true for anyone. Hey, they aren’t stupid. It’s their business to write good fortunes! It’s like writing horoscopes. Even if you read someone else’s horoscope, there is a lot in it that might as well apply to you, if you think about it. And that’s what makes these fortunes always come true. When you *think about it* – you are focusing your attention on something that you want to happen – or appreciate that this fortune has already come true for you. It is this FOCUS on something good that you anticipate (or appreciate) that makes it always come true. That’s already happened for me. At least the jewelry part. I inherited jewelry from my mother and my grandmother. Most of these pieces don’t have a lot of monetary value, but they bring back some wonderful memories and I am very grateful. That’s also true, although it’s something I need to work on every day. I’m not always 100% happy with the housekeeping habits of everyone in my house, but I think everyone is a nice person and we get along well. There is much more to be happy about than to complain about. So I choose to be happy. That’s true, for whatever I choose to do with my hands or my mind or my time and effort. If I choose to go running, and do it, I am fortunate. If I choose to call my family or friends to catch up, and I do it, I am fortunate. Even if I choose to touch a hot burner on the stove, and get burned, I won’t do it again, so I am fortunate because I learned something. It’s when you do nothing at all, that you are not choosing what you want, and are not taking responsibility for creating your own fortune. What you do with your fortune is your own responsibility. I rarely see bad ones. But if you do get a bad one, you can throw it out! It’s only a fortune cookie! Somebody else wrote it! 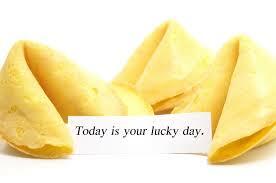 Choose your own fortune, and it will always come true!